ALMOND OIL – extracted from almonds. Almond Oil is superbly penetrating, creating a youthful, soft, skin, due to softening sterolins, Vitamins A, B, and E.
Almond Oil can be useful as a deep conditioning hair oil, as it drenches the hair with sustained moisture, preventing breakage and smoothing frizzy hair. Almond Massage Oil provides a massage texture that is neither too thick, nor too thin. 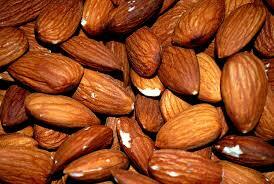 Pour Almond Oil over your food, for an internal anti-aging and anti-inflammatory effect. Our Vegetable Oils are: Extracted through cold pressed methods. We do not employ the use of solvent, hexane or alcohol extraction. We do not stock oils that have been processed through heat intensive hydraulic extraction, as these methods produce unhealthy oils, that lack the qualities we require for skin rejuvenation and health.